Late fall in New England offers some interesting exhibits for the cultural traveler and the last gasp leaf lookers. 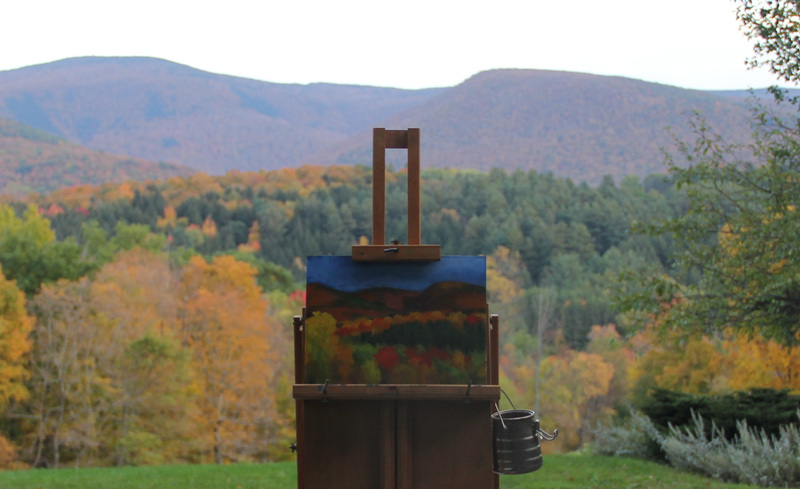 This fall I began in Maine where I have been painting and exhibiting for over 30 years. Janet Mendelsohn in her just released book, Maine Museums, features a chapter of an interview with me and my suggestions of Maine art museums to visit. First stop is the Portland Museum of Art which has an extensive Winslow Homer collection, along with the newly acquired Winslow Homer studio in Prouts Neck, which is being renovated and will be opened September 2012. I found visiting his studio and surroundings helped contextualize his paintings -a foggy day informs his grayish skies as the sea and rocks in his painting are those he saw from his studio or nearby. The Portland Museum of Art currently has an exhibit from the Vogel Collection (50 Paintings for 50 States) and Gather Up the Fragments: The Andrews Shaker Collection of Shaker art which originated at the Hancock Shaker Village near Pittsfield, Mass., which can be visited at the end of this loop. I was happy to see this exhibit is funded in part by The National Endowment for the Arts (I am on the National Council on the Arts). Continuing up Maine Route 1 is Bowdoin College, which like a number of colleges and universities, has an excellent teaching collection and is free. I visited an exquisite Hopper exhibit organized with the Whitney this summer (I thought his small oil panels from Monhegan were gems). Bowdoin’s current exhibit ranges from objects from the Bronze Age in China to Masterpieces of European Painting from the Wadsworth Atheneum. Continuing north on Route 1 to Rockland is the Farnsworth Art Museum with a nice collection of American Art (my painting Friendship II is part of their permanent collection) and a current Louise Nevelson exhibit (she hailed from Rockland), I was drawn to her collages more than her paintings. I was also pleased to see books about my paintings in their bookstore. In Rockport, a little farther north, is the Maine Center for Contemporary Art featuring Maine artists (and which I have supported over many years through their annual August auction). I then headed west to Dartmouth College’s Hood Museum of Art, another excellent teaching collection. I recently gave a talk at the museum on the watercolors in their collection. I always enjoy seeing Perugino’sVirgin and Child with Saints, Rockwell Kent’s A New England Landscape and the Assyrian reliefs. You can get a cup of coffee either at Collis Center or The Dirt Cowboy Café and then head west to Williamstown and the Berkshires. While a student at Williams College I was a docent at The Sterling and Francine Clark Art Institute. After visiting Homer’s studio it is interesting to see the Homers particularly Eastern Pointand West Point, Prout’s Neck at The Clark. An art history paper written years ago when I was a student at Williams College was about Homer’s painting The Undertow, a highlight of the collection. The view from the new Tadao Ando Stone Hill Center terrace is breathtaking and a place I particularly enjoy painting as I have been doing a series of landscape paintings in the Berkshires. The Williams College Museum of Art is another excellent teaching collection and a couple of my paintings are included in their collection as well. They also have my NASA print, Columbia Tribute. While a student at Williams College I wrote my honors thesis with Lane Faison who was director of the Williams College Museum and one of the heads of the Williams Art Mafia. These collections, both at The Clark and Williams College taught me to look, which has helped inform my paintings. Close by in North Adams, Massachusetts is MASSMoca. The space intrigues me, it’s an old Mill and interesting from inside and out. Both the Gramercy Bistro Café at MassMoca and the café on the terrace at the Clark are worth a stop. There are so many other smaller museums that could be visited from here, The Mead Art Museum at Amherst College, Smith College, Mt. Holyoke, Vassar, Middlebury all have excellent college museums. Although waning, there is still a bit of color for those who want a last gasp late fall trip — besides great art there is inspiration along the way.